Anyone notice some weird VHS-ey waving dots that are shown on episodes that were made before 2002. Not the flashing cue dots that appear in season 1, due to cel animation, I'm talking about weird wavy lines or dots on bright objects. These only appear on TV, not DVD, since the DVD episodes are remastered. Look at the orange flower, and you'll know what I'm talking about. 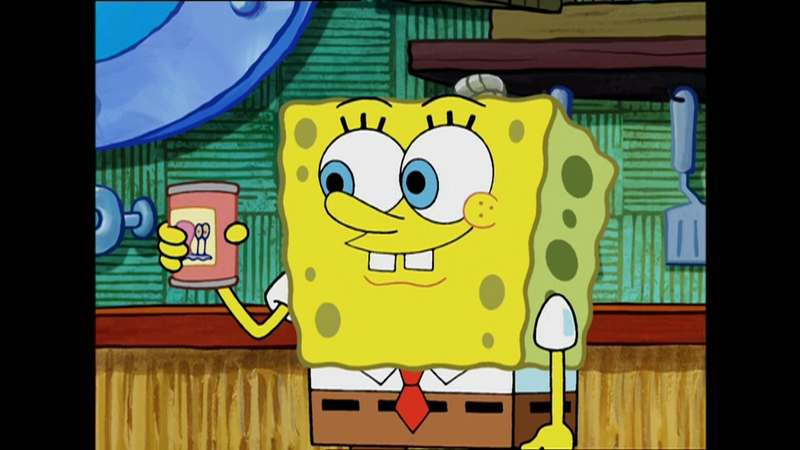 This isn't only in spongebob, this weird effect is seen in a lot of older shows that were made prior to 2002 or 2003. I think it’s because Season 2-8 were drawn on 480p screens, yet some parts were digitally messed up to accomodate 480i TV screens. Either way, I find this to look nicer due to the more vivid colours and a slightly higher refresh rate, but I can see why it’d be distracting. Nick should try to make the episodes in HD like CN does with a lot of their old programming (such as Teen Titans, old Scooby-Doo Movies, and that Billy and Mandy special they aired recently in October). I actually mentioned this in a recent topic I made. Is it possible for Nick to fix this? They fixed it on DVD, so why not TV? 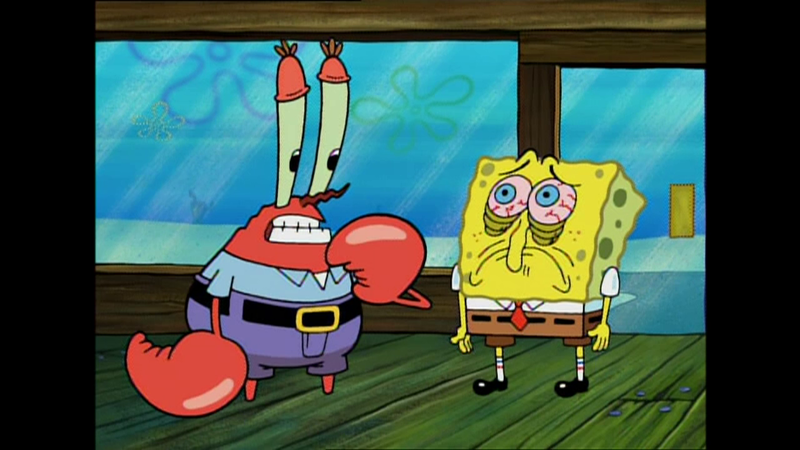 Speaking of which, SpongeBob is actually yellow on TV, and if Nick fixes that problem you're stating, it would be on par, if not better, than the DVD's! In my opinion at least. They probably don't improve the quality like they do with the DVDs. It's a distortion based on the analog source of the episodes, if I recall correctly (has something to do with the deinterlacing method) - lots of older shows face the issue, as you said. Also, kind of weird. In some episodes like "Have You Seen This Snail? ", some scenes look perfectly normal, but then it cuts to another and it looks like it was from a VHS or something. Yeah, like the scene where Spongebob was crying on the kitchen, it looked all VHS-ey, but then next thing you know, when Gary is with the old lady, it's back to normal. This issue never occured in seasons 6-8, all the studio equipment went digital by then. I think after season 5 or so, they stopped producing episodes on master tapes, and switched to having the episodes air on tv, by using digital computer files. Something similar happens in the digitally colored seasons of dexter's lab, one scene looks all new and clear, then next thing you know the lines get wavy and it looks all VHS-ey. Yet Nickelodeon hates CN and wants nothing to do with them. I swear it seems like the issue is always with orange flower clouds. If that's true than why would advertise TTG's 100th episode or whatever that was? I remember them advertising that a while back and I never understood why. I remember seeing Gumball and We Bare Bears advertisments too. Can't hate them too much if they're willing to advertise their shows on occasion. Was this wavy issue in the origanal airings of the episodes? I don't know. I'm too young and from another country to knew that. No it wasn't I remember seeing the episodes in their original airing. Then again when the episodes first aired I watched them on an older tube based tv.